Tuffati nella ricca cultura della Catalogna con un'escursione di un'intera giornata a Montserrat e Penedès da Barcellona. In un minivan di lusso, viaggia nel cuore della campagna catalana per ammirare la colossale montagna di Montserrat, un punto di riferimento naturale mozzafiato le cui creste distintive sono il risultato dell'erosione. Visita il sacro monastero benedettino, sede della venerata Vergine Nera, e ascolta i toni celestiali del coro di un ragazzo. 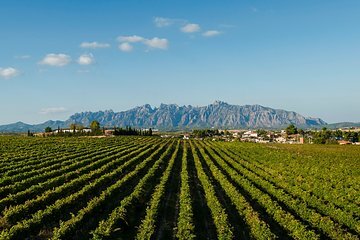 Quindi, esplorare i vigneti verdeggianti della regione vinicola del Penedès e ricevere un'intrigante introduzione alla storia della produzione vinicola della Catalogna. Just 2 of us on the trip with a most excellent, informative guide, Monia. Great information and very personable. Tina at Llopart was also very knowledgeable and informative. Perhaps the best day tour I've ever been on. This was an amazing tour. We were very lucky, it was a private tour as there were only 2 of us. Vincente was extremely knowledgeable. Vincente was also very engaging, we enjoyed our conversations very much. Monserrat is stunning, a must see. We enjoyed the Cava Tour at Codorniu as well. The pace of the tour was great, did not feel rushed at any time. Would totally recommend this tour to see something outside of Barcelona. This was just a wonderful day tour to Montserrat as well as to a Cava winery. OUr guide Nuria was wonderful as she pointed out many items and places of interest. Montserrat is a beautiful facility in a gorgeous location - definitely well worth visiting. And the Cava winery tour was wonderfully impressive. I can't recommend this tour enough!! We were so fortunate to have a tour guide to ourselves a party of 2. She really knew her stuff and we had a great time! This was a great tour. The only thing we would change is vehicle size. The van they had was extremely tight and uncomfortable for 8 adults. It was a great tour! We went in the morning to Montserrat and then the winery in the afternoon. We rode a funicular at the monastery and two trains at the winery. It was a wonderful tour, the scenery was gorgeous, and the tour guides were great, informative, and very personable. There were only five of us on the tour, and we were a party of three. It was a great day!